out to the island's best beaches. WE Only Rent For Periods of (7) Nights Minimum. at a one week rate. similar rental property or place you in an upgraded property. Village Home #2 is a fully equipped three story - single family home. (3) Minute Walk to "Secluded/Private Pool"
and social calendar will add to your Florida experience. Gasparilla Island, which is located between Fort Myers and Sarasota. and some of the world’s best tarpon fishing. swimming, shelling. Nature trails are available for hikers. working, wooden U.S. Coast Guard lighthouse, built in 1890.
where you’ll find upscale boutiques, art galleries and fine dining. streets and on the golf cart paths throughout the entire island. This is a Non-Smoking Home and Pets Are Not Permitted. Village Home #2 is a fully equipped Three Story Single Family Home. 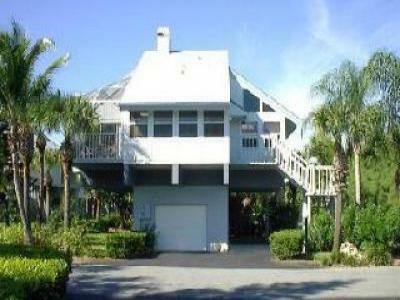 It is located on the exclusive barrier island known as Boca Grande. Just steps to our private 62 acre white sandy beach. -Three Minute Walk to "Private Pool"
sure to visit our village for some great shopping opportunities. personal trainer, water aerobics classes, yoga and tennis lessons. All Instruction classes are offered from November 1 - April 30.
pool Mondays, Wednesdays, and Fridays 9-10 a.m.
tennis courts, which are all clay. Two are lighted for night play. located across our tennis court. courts at the playground area. the smooth blue waters of the Gulf of Mexico. Clubroom as well as at the Cafe by the Pro Shop. offer a range of books on the honor system. herbs such as basil, parsley and rosemary from our herb garden. of Mexico. Spectacular ocean front views of each evening's sunset. opportunities abound in the quaint village known as Boca Grande. wished. Boca grande village home has additonal photos.